This week my cool son and even cooler hubby are going to be off enjoying the mountains at Camp Loll. They went there two summers ago and it's been the camp they both liked the most. After watching my son pack and repack his stuff over the past week and listen to my husband plan, shop and pack the troop...I'm excited it's finally here. But the reason for this post is to share a conversation I had with my son before he left. Son's response: "Mom, I don't care about the merit badges. That's not why I go to camp. I go because I like camping!" I have been reflecting a ton about grandparents this week (both good and bad). But I'm lucky enough to still have a couple grandparents here on this earth and we sure need to spend more time getting to know them better before they're gone!! Anyway, I created these two layouts, but regretfully they are not mine or my kids grandparents, but hey the layouts are cute. In fact, they're a brand new template available at My Memories Suite. 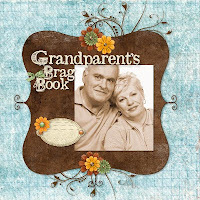 It's a beautiful template set called "Grandparents Brag Book" created using the gorgeous designs from Miriam Lima (my very talented friend)!! Doing a Little Digi Scrappin!! Yesterday was a productive day...actually finished four layouts and happy to share them. Description: Happy Garden by Traci Murphy. Created in My Memories Suite software. Have you ever heard of a great scrapbook manufacturer out of Portland called Paper Trunk? Well they have some beautiful paper designs and I've been watching them for a while. So I was thrilled when I saw that they are now offering their beautiful paper designs digitally now!! And even better is only available right now for the My Memories Suite software (my favorite of course). Below are a few layouts I created using their new digi papers. Description: Created using the Batik Digital Paper Pack from Paper Trunk. Layout was created in My Memories Suite. Description: Layout created with the new Gigi Collection by Paper Trunk. Created in My Memories Suite software. Description: Layout created with the new Jellybean Collection by Paper Trunk. Created in the My Memories Suite software. I took one of those random quizzes and finally one that got it RIGHT!! You are lively and fiery. You embrace the world and live passionately. You are moody but generally enthusiastic. You love so many things. You are able to have a lot of drive and focus. Some people would call this obsession. You are aggressive about getting what you want in life. You look out for yourself first. 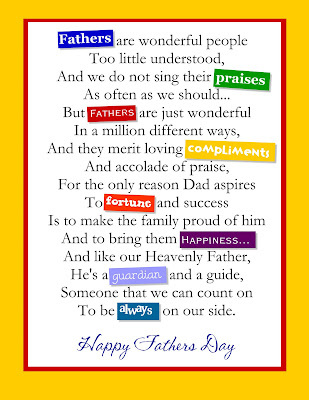 A friend of mine called this morning and told me that she was in charge of the "Fathers Day Treat" that will be handed out at church on Sunday. They're making "bow ties" out of bags of M&Ms, which I thought was a darling idea!! But she also needed a poem to go with the treat. I thought I'd share and "yes" it was created in My Memories Suite...only took me a few minutes, but I just had to share!! Feel free to use the graphic if you need it...just click on it and it will open up in a new window much larger. You can then print it off or save it to your computer. I actually brought this into WORD and printed 4 to a page!! I've had a few friends contact me lately asking me where they can get 12x12 layouts printed, so I thought I'd dedicate a post to this very topic. First off, some of in the Utah area might have seen the Ettes on Good Things Utah Monday and they showed some of my layouts during the segment. Here's the video if you missed it. Those beautiful layouts were created in My Memories Suite and printed by a friend of mine, Marietta Campbell that lives in the Layton area. She does a beautiful job and will print them for as little as $1.80 a sheet. You just have to email her your images or provide her with a disk and give her a day to get them printed. If you are in the area and interested in contacting her, you can get her contact information from her BLOG (go to her profile). I happened upon a darling Etsy shop today and had to share. It's called Cranberries & Capers. If you're looking for cute, one-of-a-kind clippies & hair bows for your little girl she has some one of a kind designs. I really loved the clips for pacifiers, but wondered if I could modify it to hold my glasses instead (wink).Cindy started making clippies for her two girls and just fell in love with this new way to express herself creatively. She started selling them through her blog at first to family, and then friends, and then strangers. Then not long ago she opened an Etsy shop in hopes of sharing her clippy goodness with more people. She works hard to make sure they are each super cute and well-made. 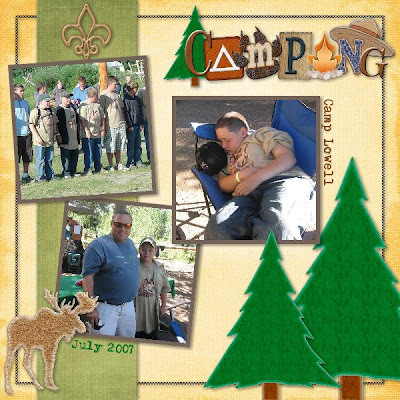 I have a ton of Cub Scout and Boy Scout pictures of my son that I've wanted to scrapbook for a long time and have never take the time to complete....until I started playing around with some great new templates that they're offering on My Memories Suite website. The Cub Scouting one is called "Blue & Gold Cubs" and the Boy Scout one is called "Roughing It."